Now that they have been available for a few months...the feedback on the 08 DNA has been poor. Too fast, too light, too sick! Frankly, an unfair advantage. We really take these comments to heart so for those of you who have been sending them to us....BUY ONE!!! 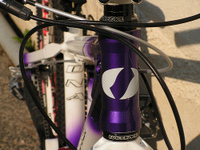 Seriously, the 08 DNA is all over the pump tracks and parks in New England, the West Coast and everywhere in between. Take a look at a few of these sick custom paint and decal setups. First, we have a build from our Colorado Lifestyle Rep, Jesse Riel. That's right RielTime evvvverybody from Zone 5 Sports Action Group. Jesse does so much for Sinister and we can't thank him enough for all of his efforts. Jesse has been sending us all the race news from CO and we will do our best to get it to you all soon. Next up is Sinister Team Rider Derek Stevens. Yeah, we know, now you want to put your decals on like that. I'm sure Derek won't mind, but if you are chased down by an angry Gorilla next time you are at Highland MBP....consider yourself warned!! He loves that fork! Finally, in the "Holy S are you KIDDING" category is UF1's build. This unreal paint is above and beyond custom. We all love the fade...don't be afraid of the fade. So here's the deal. Buy a DNA, impress all of your friends with your new skills and we'll post your bike as a "Build of the Week"....and who knows, you may even get a spotlight in our upcoming Newsletter..
Yeah, we've been busy and a little slack on the blog, but what better way to get it rolling again than with two great builds from Asia! The fist one represents the 1st Sinister Mustang build by a customer in Asia...welcome aboard Mr. Fumimori Otsuka! We are all stoked here at Sinister about the enthusiasm and support by the riders in Asia and we look forward to all the updates so keep them coming!!! The man responsible for spreading the word about Sinister Bikes is a long time supporter Mr. Eric Chng. We will be getting updates from Eric all season long and will keep you all posted on all his accomplishments throughout the season. Check out Eric's DNA build as well. Thanks guys! Salsa Delgado Discs (Standard 36h out back...has a hop...front Race 32h, perfect) Rear laced to a Ringle Abbah with 10mm step down axle (NYC Freeride). On One fleegle Bar (also have truvativ Lo-rise XR bar if you'd prefer. Here's Nick Martins' from the Sram corporation, DNA. 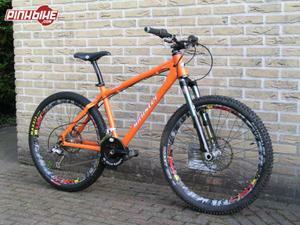 check out the sick build,.....sweet Argyle fork! This weeks entry is from Jay over at Department Forty-Five clothing(http://www.deptforty5.com/index.htm). If you haven't checked out the stuff yet, you're missing out! a big shout out from Sinister to the boys over at Department Forty-Five! Rider owned for life baby! Check out this killer DNA.....get yours today, we have a new shipment coming back from paint this week! R-9 is a beauty too and check the orange e-13 guide..bitchin! new batch of r-9's are nearly ready to be sent to heat treat...get your name on on of the new ones! This "Build of the Week" has spawned into "builds" because the owner has an amazing quiver of bikes that need to be showcased for the world to see! These builds are a little bit of the old school meets new school parts! 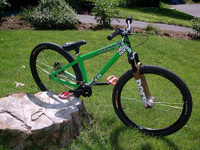 check this out ...the guacamole dna jumper from Rob D.
"This is my DNA jump bike, it has been in the works for quite some time. 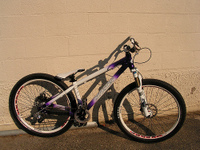 It has 4130 wrap jump bars made by Chris at Thick bikes. I had to wait for the Odyssey Guacamole groupo to come out to get the team grips and Jim Cielencki pedals that match the green anodized bits. 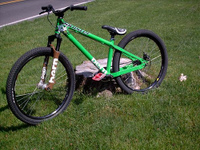 The fork is a lowered Argyle 302 sitting at 60mm; it feels super good." thanks so much Rob! Check out these other builds from rob D! sweet 04 ridge and 04 DNA! pics should be no wider than 800 pixels. ideal set up would be 400x700 or vice versa depending on orientation. send em in!